It is not uncommon for dogs to eat their own feces or poop of other animals. This is their natural behavior, although it is very disgusting for us humans. The professional term for this is called Coprophagia, and why dogs eat poop can be related to numerous reasons. Anyhow, you are probably wondering about how do you stop your dog from eating his poop or how to stop your dog from eating cat poop. The answer to those questions can be seen below. The following are some main reasons why dogs eat feces and the solutions about how do you stop your dog from eating his poop. One of the most common reasons for a dog to eat its own poop is hunger. If the dog had not eaten his meals regularly, or if his dog food is not enough to satisfy his hunger, then the dog may start eating the feces of other animals. Besides hunger, excessive intake of food can also lead to a dog eating own poop or poop of another animal. The third reason for eating poop is because of worms and parasites present in the dog`s stomach. These parasites can deplete the nutrients, so the dog can start searching for alternative foods. Bad dietary habits are another reason why dogs eat poop. If the food lacks enough vitamins, minerals, and proteins, then the dog will naturally start looking elsewhere to replace the missing nutrients. Stress is another common reason for dogs to eat their poop because that can be seen as a way to divert their attention from stress. Boredom, experimentation, and lack of attention are a few other reasons for dogs to eat their poop. An interesting fact is that female dogs are used to eat feces of their small puppies after they get born. This is their natural instinct to keep their puppies clean and to remove evidence of puppy scent. They do this in order to protect them from predators. People often ask how to prevent this disgusting dog habit. Below we have highlighted the best ways how to prevent your dog from eating feces. If you have a dog that is exhibiting this kind of behavior, you have a few options to fix the problem. The first thing you can do is to observe and manage the things every time your dog relieves himself. 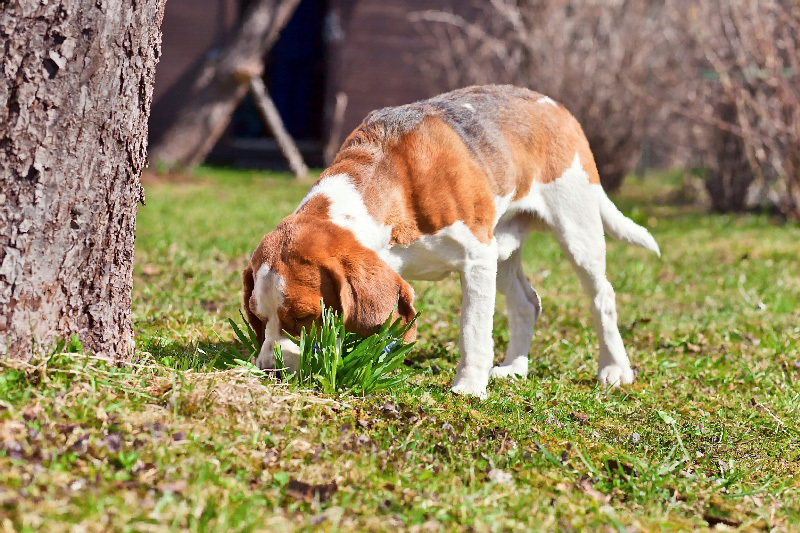 If your dog takes a poop in the yard, then always make sure that you will clean after he is done with his excretion. If the dog has a habit to run off and eat his poop after defecating, then keep him secure on the leash near you until he stops running and eating poop. Another way of how do you stop your dog from eating his poop is to teach him commands when to ‘leave’ and when to ‘let go’. You can use toys to train your dog. Just give the dog some of his toys for him to play with and hold the one part of the toy. Give the dog a command to ‘let go’ and if the dog gives up pulling the toy, you can give him a nice treat as a reward. Do this over and over again and your dog will learn to obey the command you give to him. When you go out on a walk with your dog and if your dog sees feces and wants to eat them, try to divert the attention of the dog by giving him some nice food treat. Reward him for his good behavior and eventually, you will learn how to stop your dog from eating cat poop easily. If your dog finds poop of another dog or cat and starts eating it, try to be patient and give a proper command to the dog. Avoid being angry or frustrated, and avoid yelling at the dog because he might get mixed signals about why you are yelling and may continue to eat the poop. If you believe that your dog is not exercising enough, then you may consider taking him out for a longer time. That way he can run and walk with you, play games with you and if you give him good attention then the dog may stop going after poop and be more focused on you. If you think that the reason for your dog to eat feces is because his diet is not right, check out the food you are giving to him. If the food has low nutritional value and high amount of carbohydrates, then change his diet. Give the dog a better food with a larger number of proteins, vitamins, and minerals. You can ask your local veterinarian for advice about a good diet for your specific type of dog(Learn more about dog diet in our dog appropriate HP-LC diet article). So instead of wondering how do you stop your dog from eating his poop, be active and do something for your dog. Another good thing to do regarding the eating habits of your dog is to add meat tenderizing ingredient to his meals. These ingredients have many enzymes that help the dog to better digest the food he eats. That way the dog will be less likely to eat his own poop or to run and eat someone else’s feces. Additionally, a good method for how do you stop your dog from eating his poop is to add some pineapple juice to his regular food. One large spoon would be enough for most types of dogs. The pineapple juice works well in preventing your dog from eating feces. If you want to try more professional ways then you can buy some specially made liquids or other additives from a pet store. The natural additives have a good effect on most dogs in preventing them to go after eating their poop. Finally, if none of the methods seem to work and you believe that your dog is eating poop because of some medical reasons, then schedule an appointment in the veterinarian office and get your dog examined. The vet will be able to determine the root cause why your dog is eating feces and will suggest the best ways for eliminating that bad habit.